Hugh Durrant-Whyte is Chief Scientific Advisor for the UK Ministry of Defence. 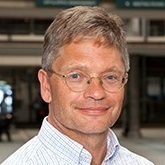 Hugh Durrant-Whyte is also a Professor, ARC Federation Fellow and Director of the Centre for Translational Data Science at the University of Sydney. From 2010-2014, he was CEO of National ICT Australia (NICTA), and from 1995-2010 Director of the ARC Centre of Excellence for Autonomous Systems and of the Australian Centre for Field Robotics (ACFR). He has published over 350 research papers and founded four successful start-up companies. He has won numerous awards and prizes for his work, including being named the 2010 NSW Scientist of the Year. He is an honorary fellow of the Institute of Engineers Australia (HonFIEAus), a fellow of the IEEE (FIEEE), of the Academy of Technological Sciences (FTSE), of the Australian Academy of Science (FAA), and of the Royal Society of London (FRS).